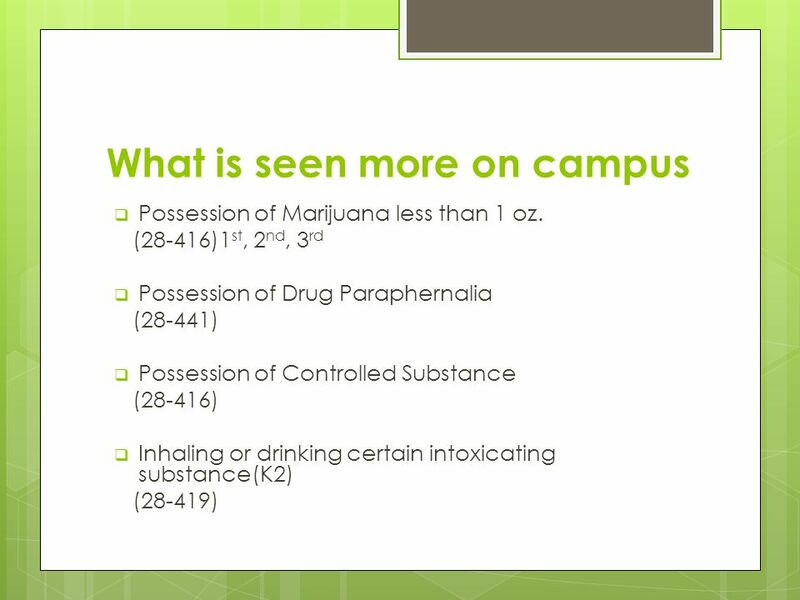 The illegal possession, use or distribution of drugs or alcohol by any persons is a violation of university rules as well as state and federal laws. Officers of the University cooperate with State and Federal agencies in the prevention of drug abuse. 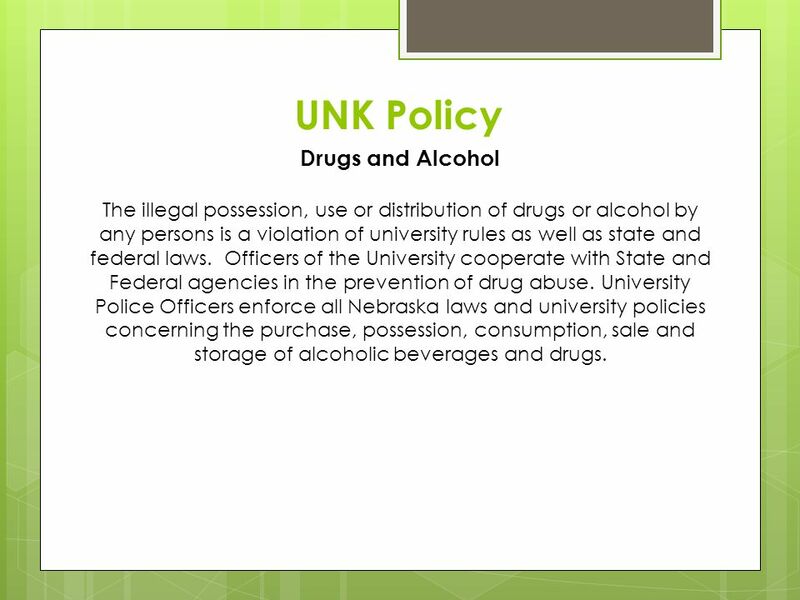 University Police Officers enforce all Nebraska laws and university policies concerning the purchase, possession, consumption, sale and storage of alcoholic beverages and drugs. Distorted sense of time Paranoia Magical or "random" thinking Short-term memory loss Anxiety and depression These psychological signs of using pot also generally ease after a few hours. But residual effects can last for days. 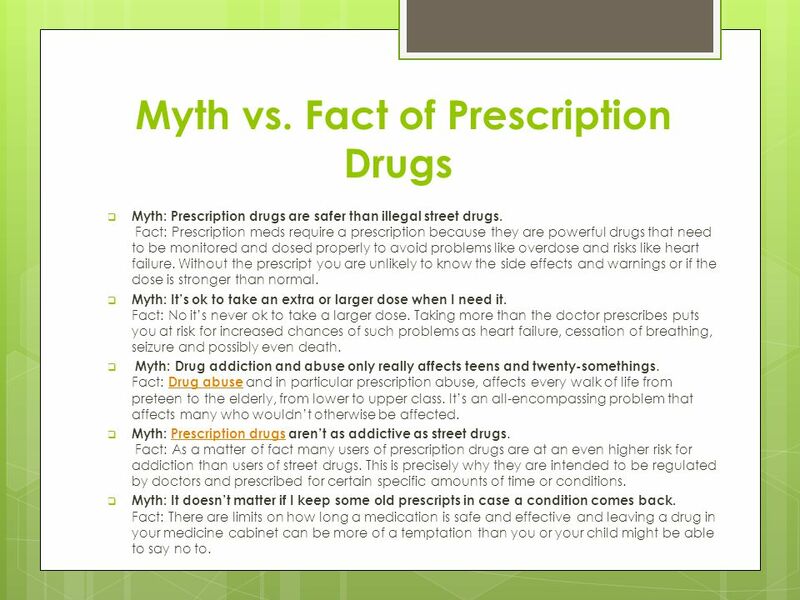 Myth: Prescription drugs are safer than illegal street drugs. Fact: Prescription meds require a prescription because they are powerful drugs that need to be monitored and dosed properly to avoid problems like overdose and risks like heart failure. 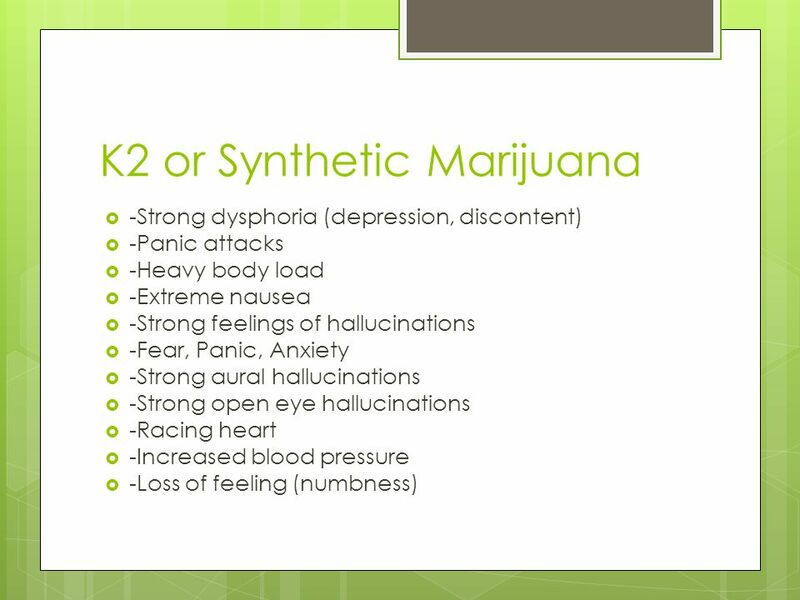 Without the prescript you are unlikely to know the side effects and warnings or if the dose is stronger than normal. Myth: It’s ok to take an extra or larger dose when I need it. Fact: No it’s never ok to take a larger dose. Taking more than the doctor prescribes puts you at risk for increased chances of such problems as heart failure, cessation of breathing, seizure and possibly even death. Myth: Drug addiction and abuse only really affects teens and twenty-somethings. Fact: Drug abuse and in particular prescription abuse, affects every walk of life from preteen to the elderly, from lower to upper class. It’s an all-encompassing problem that affects many who wouldn’t otherwise be affected. 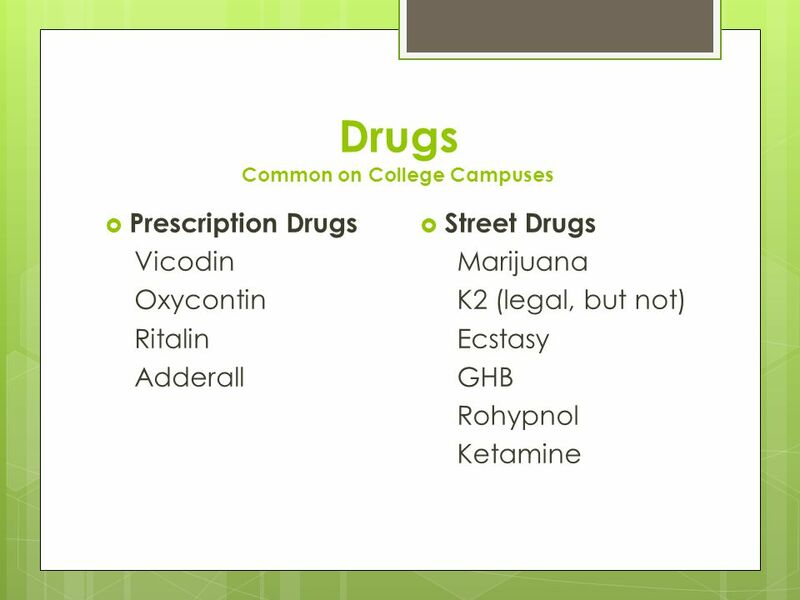 Myth: Prescription drugs aren’t as addictive as street drugs. Fact: As a matter of fact many users of prescription drugs are at an even higher risk for addiction than users of street drugs. This is precisely why they are intended to be regulated by doctors and prescribed for certain specific amounts of time or conditions. Myth: It doesn’t matter if I keep some old prescripts in case a condition comes back. Fact: There are limits on how long a medication is safe and effective and leaving a drug in your medicine cabinet can be more of a temptation than you or your child might be able to say no to. It is legal to purchase and posses, but it is Illegal to consume. Nebraska State Laws Minor in Possession/ Minor in Consumption of Alcohol No minor may sell, dispense, consume, or have in his or her possession or physical control any alcoholic liquor in any tavern or in any other place, including public streets, alleys, roads, or highways, upon property owned by the State of Nebraska or any subdivision thereof, or inside any vehicle while in or on any other place, including, but not limited to, the public streets, alleys, roads, or highways, or upon property owned by the State of Nebraska or any subdivision thereof. 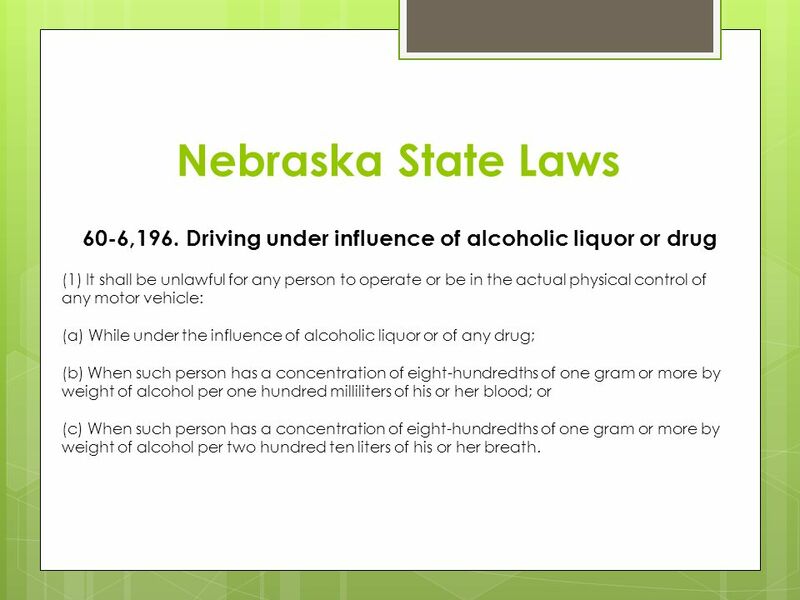 Nebraska State Laws 60-6,196. Driving under influence of alcoholic liquor or drug (1) It shall be unlawful for any person to operate or be in the actual physical control of any motor vehicle: (a) While under the influence of alcoholic liquor or of any drug; (b) When such person has a concentration of eight-hundredths of one gram or more by weight of alcohol per one hundred milliliters of his or her blood; or (c) When such person has a concentration of eight-hundredths of one gram or more by weight of alcohol per two hundred ten liters of his or her breath. 14 Myth vs. 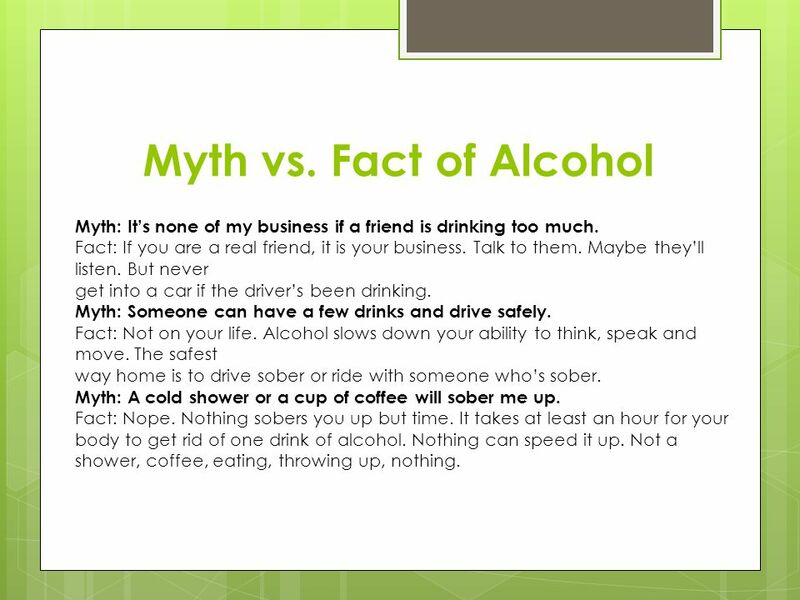 Fact of Alcohol Myth: It’s none of my business if a friend is drinking too much. Fact: If you are a real friend, it is your business. Talk to them. Maybe they’ll listen. But never get into a car if the driver’s been drinking. Myth: Someone can have a few drinks and drive safely. Fact: Not on your life. Alcohol slows down your ability to think, speak and move. The safest way home is to drive sober or ride with someone who’s sober. Myth: A cold shower or a cup of coffee will sober me up. Fact: Nope. Nothing sobers you up but time. It takes at least an hour for your body to get rid of one drink of alcohol. Nothing can speed it up. Not a shower, coffee, eating, throwing up, nothing. 15 Myth vs. 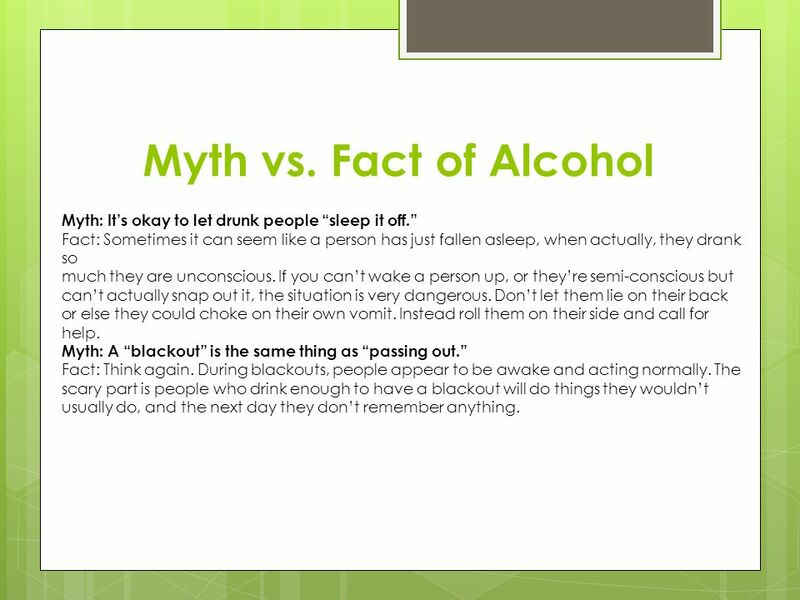 Fact of Alcohol Myth: It’s okay to let drunk people “sleep it off.” Fact: Sometimes it can seem like a person has just fallen asleep, when actually, they drank so much they are unconscious. If you can’t wake a person up, or they’re semi-conscious but can’t actually snap out it, the situation is very dangerous. Don’t let them lie on their back or else they could choke on their own vomit. Instead roll them on their side and call for help. Myth: A “blackout” is the same thing as “passing out.” Fact: Think again. During blackouts, people appear to be awake and acting normally. The scary part is people who drink enough to have a blackout will do things they wouldn’t usually do, and the next day they don’t remember anything. BAC = 0.03 to 0.12 percent •They become more self-confident or daring. •Their attention span shortens. •They may look flushed. •Their judgment is not as good -- they may say the first thought that comes to mind, rather than an appropriate comment for the given situation. •They have trouble with fine movements, such as writing or signing their name. BAC = 0.09 to 0.25 percent •They become sleepy. •They have trouble understanding or remembering things (even recent events). •They do not react to situations as quickly (if they spill a drink they may just stare at it). •Their body movements are uncoordinated. •They begin to lose their balance easily. •Their vision becomes blurry. •They may have trouble sensing things (hearing, tasting, feeling, etc.). BAC = 0.18 to 0.30 percent •They are confused -- might not know where they are or what they are doing. •They are dizzy and may stagger. •They may be highly emotional -- aggressive, withdrawn or overly affectionate. •They cannot see clearly. •They are sleepy. •They have slurred speech. •They have uncoordinated movements (trouble catching an object thrown to them). •They may not feel pain as readily as a sober person. BAC = 0.25 to 0.4 percent •They can barely move at all. •They cannot respond to stimuli. •They cannot stand or walk. •They may vomit. •They may lapse in and out of consciousness. BAC = 0.35 to 0.50 percent •They are unconscious. •Their reflexes are depressed (i.e. their pupils do not respond appropriately to changes in light). •They feel cool (lower-than-normal body temperature). •Their breathing is slower and more shallow. •Their heart rate may slow. •They may die. BAC more than 0.50 percent Death- The person usually stops breathing and dies. 20 What if I get caught on Campus? 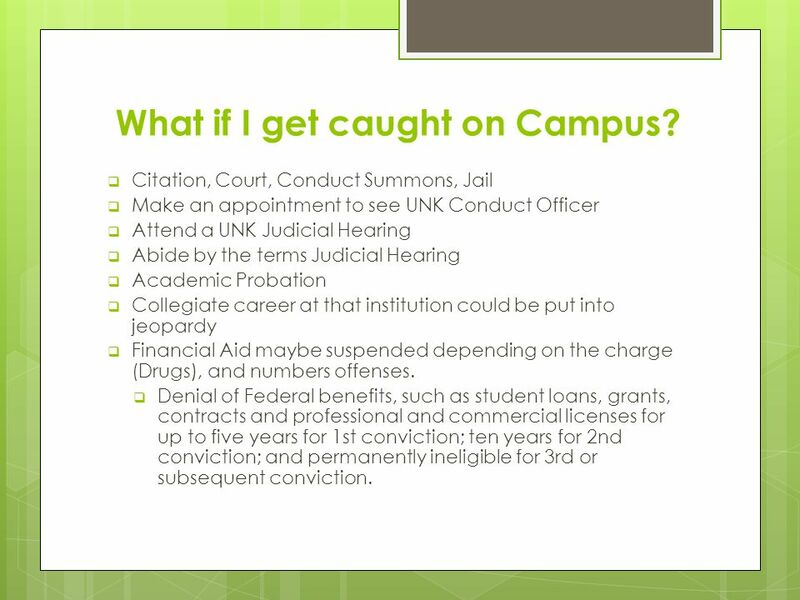 Citation, Court, Conduct Summons, Jail Make an appointment to see UNK Conduct Officer Attend a UNK Judicial Hearing Abide by the terms Judicial Hearing Academic Probation Collegiate career at that institution could be put into jeopardy Financial Aid maybe suspended depending on the charge (Drugs), and numbers offenses. 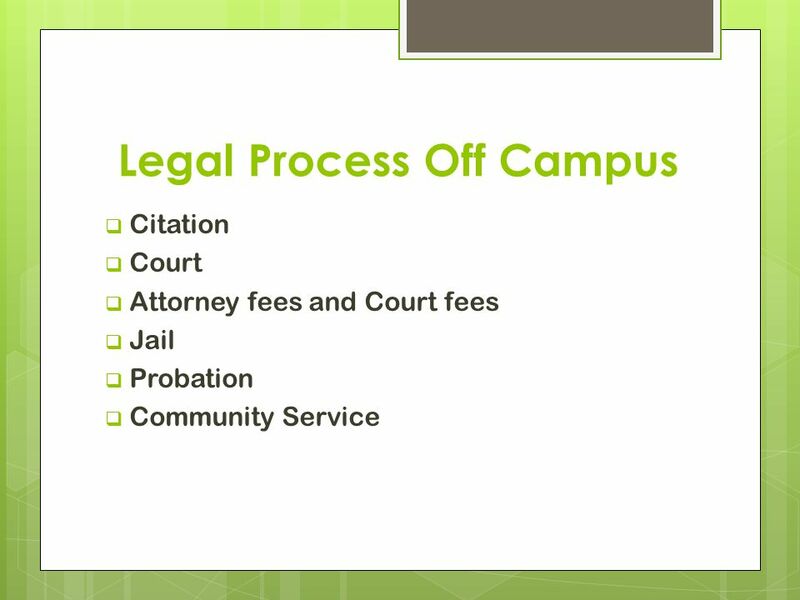 Denial of Federal benefits, such as student loans, grants, contracts and professional and commercial licenses for up to five years for 1st conviction; ten years for 2nd conviction; and permanently ineligible for 3rd or subsequent conviction. 22 What is your responsibility?? Just don’t do it Saying no is hard, starting the habit, or getting caught will have long term effects Report any type of laws being broken Your at college for a reason, don’t mess it up! 23 Here are some Crime Prevention, and scheduled events coming up next month! Here are some great resources to check out! 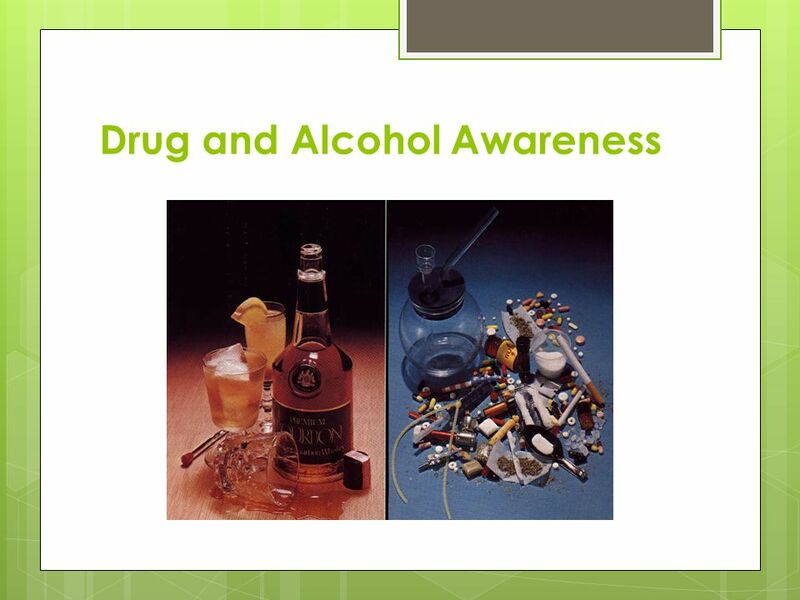 Download ppt "Drug and Alcohol Awareness"
BELL WORK Write about what you think alcohol does to your body short term. And How It Effects You. What Happens When You Drink  When you take a drink, about 20% of the alcohol is absorbed in your stomach; the remaining 80% is. 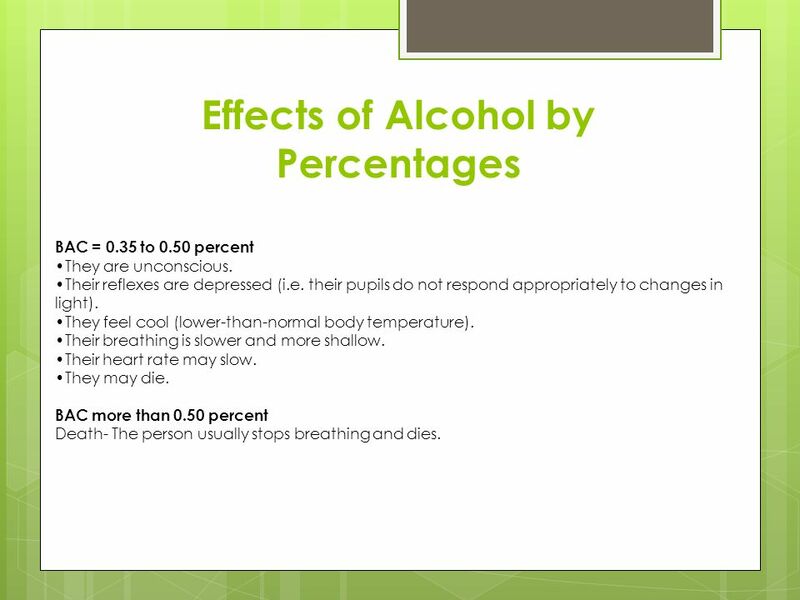 Alcohol Effects, Affects or both? 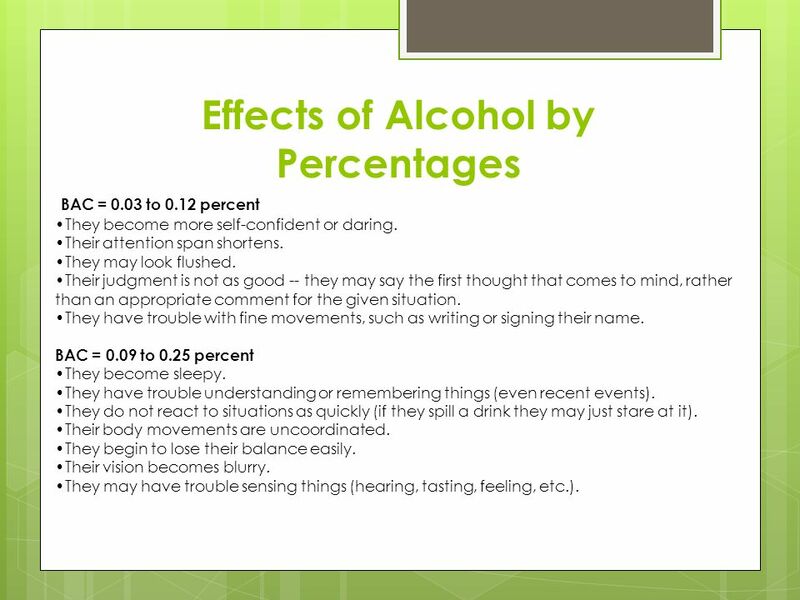 How alcohol influences Y - O – U!  What does BAC stand for?  What can sober someone up?  What are the legal limits of alcohol consumption?  Under 21?  21 and over?  What amount of. CHAPTERS 6-11 REVIEW.  Your ability to make sound judgments is the 1 st thing to be affect by drinking  True TRUE OR FALSE. 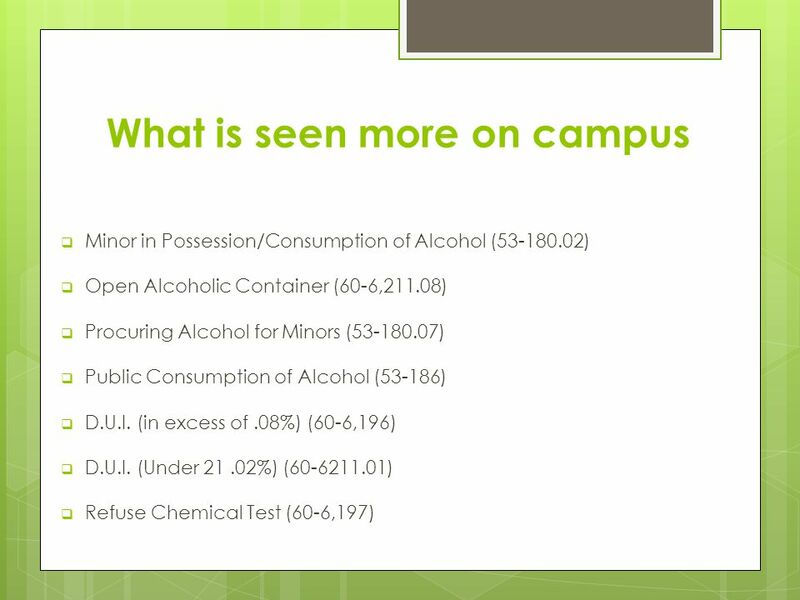 Perry County Prosecutor’s Office ALCOHOL Know the FACTS. Know the LAW. 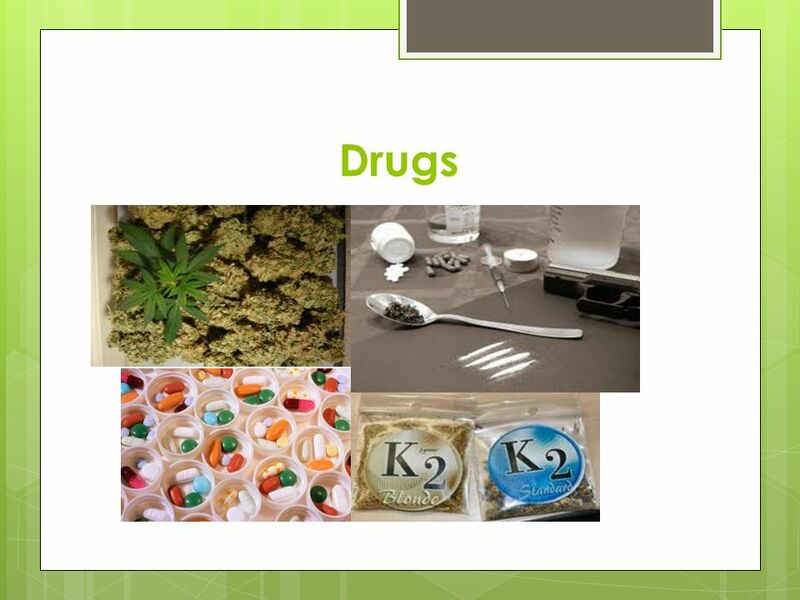 DRINKING, DRUGS, & HEALTH Driver’s Education-Period 4 Mr. Hamill. Drinking and Driving. Video Discussion What were some of your thoughts as you watched the video about these real drinking and driving accidents?  Take a Handout (Effects of Alcohol)  Using the Pages of the NJ Driver’s Manual answer the questions  We will be going over. 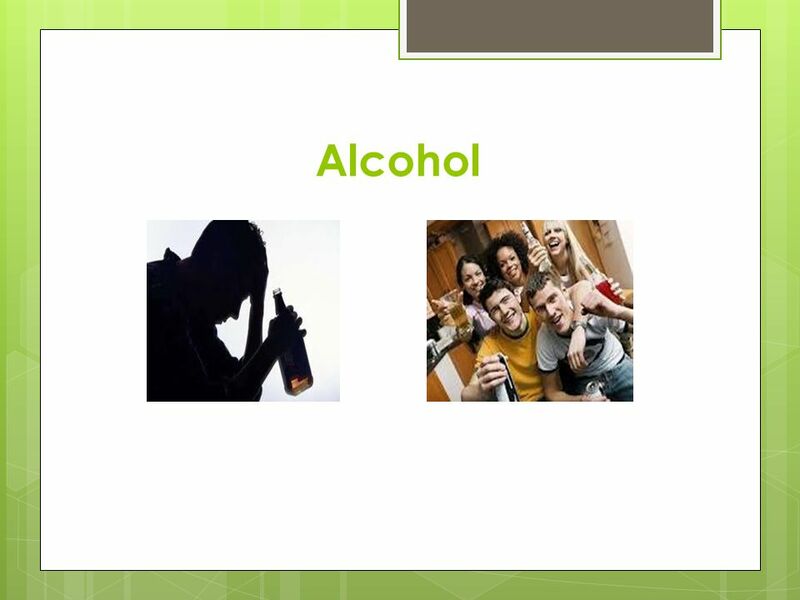 ALCOHOL Essential Question Why would YOU choose to abstain from alcohol use? Ask yourself this question- “In what ways has alcohol had a positive effect. ALCOHOL IS A DRUG!. Short Term Effects: Body Irritates the mouth, throat, esophagus, and STOMACH Irritates the mouth, throat, esophagus, and STOMACH Makes. A. Alcohol is a DEPRESSANT, a drug that slows brain and body reactions. 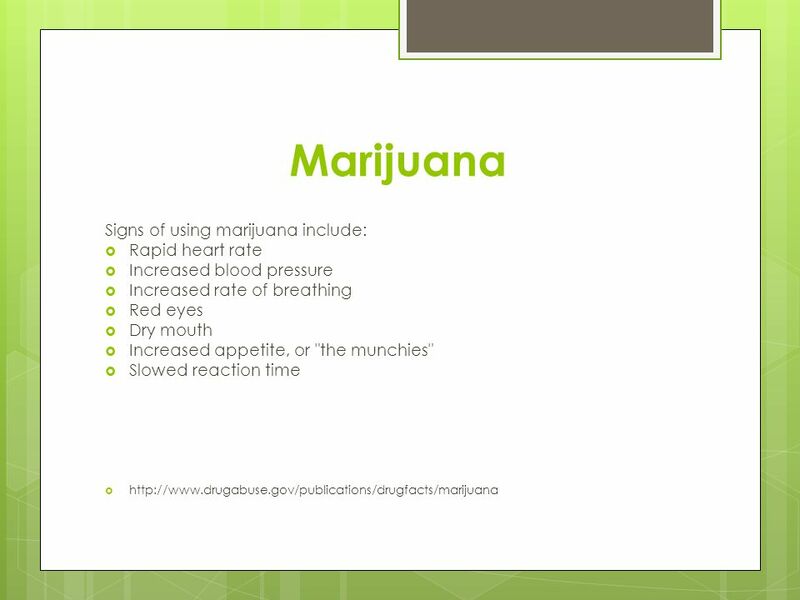 Alcohol can cause confusiuon, poor coordination, blurred vision, and drowsiness.